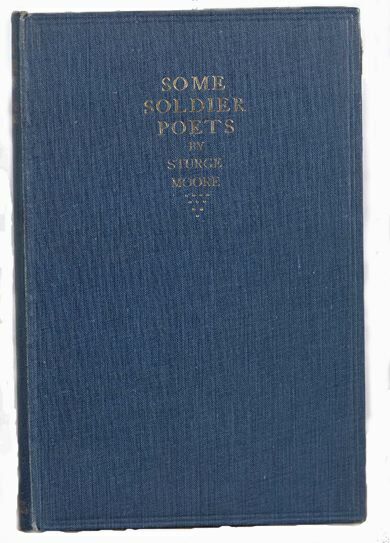 Some soldier poets / by T. Sturge Moore. -- London : G. Richards ltd., 1919. A very early (1919), and therefore quite prescient survey of Great War poetry by Thomas Sturge Moore (1870-1944). The poets Moore highlights include: Julian Grenfell, Rupert Brooke, Robert Nichols, Siegfried Sassoon, Robert Graves, Charles Sorley, Edward Thomas, Richard Aldington -- all destined to have their names on the memorial stone at Westminster Abbey -- and American Alan Seeger. 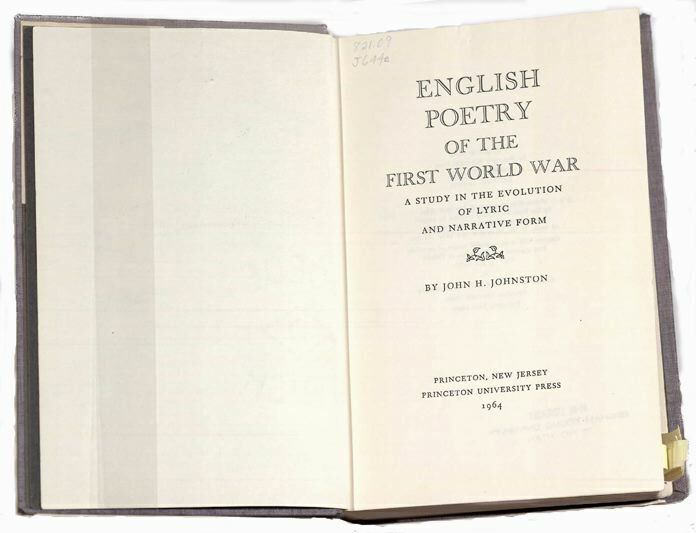 English Poetry of the First World War ; a Study in the Evolution of Lyric and Narrative Form / by John H. Johnston. -- Princeton, N.J., Princeton University Press, 1964. The first full-length study of Great War poetry, and an early champion of David Jones' epic In Parenthesis. Johnston's thesis of the evolution of lyric and narrative forms traces the lyrical poetry of "early" war poets such as Rupert Brooke, Julian Grenfell, and others; the poetic experiments of Siegfried Sassoon and Wilfred Owen; the "thematic cycles" of Robert Nichols; the narrative poetry of Herbert Read; and finally David Jones' epic prose-poem In Parenthesis. An excellent survey of Great War poetry, fiction, and memoirs. 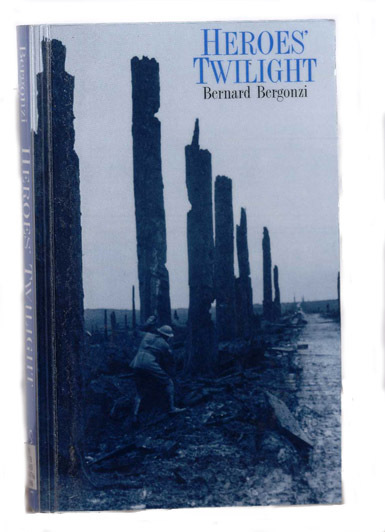 Bergonzi methodically outlines the works of the major poets (grouped together by style/time period), authors of fiction, and memoirists (and even "civilian responses") while including historical and biographical background for context. 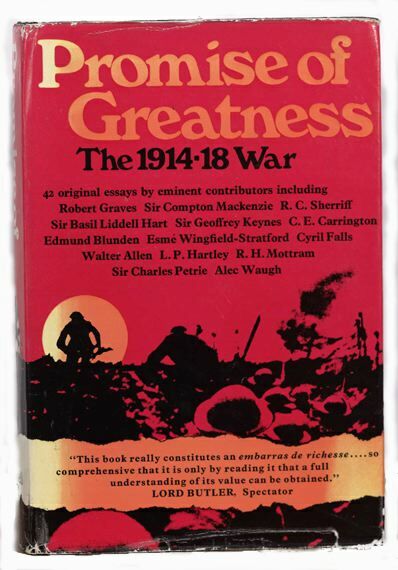 Promise of Greatness : the War of 1914-1918 / Edited by George A. Panichas ; Foreward by Sir Herbert Read. -- London : Cassell & Company, LTD., 1968. A collection of essays on the war by such writers as Robert Graves, Edmund Blunden, Sir Basil Liddell Hart, R. C. Sherriff, R. H. Mottram, Vera Brittain, and with a foreward by Herbert Read. The Great War and Modern Memory / Paul Fussell. -- New York : Oxford University Press, 1975. A landmark book, still "the classic modern interpretation" (Judd 15). Fussell surveys Great War poetry, drama, fiction, memoirs, and even letters and general culture, finding in them earlier influences, and also tracing their influence on subsequent twentieth-century writing, culture, and thought. This is the book with which all subsequent critics have had to deal -- a knowledge of it is essential to the study of Great War literature. 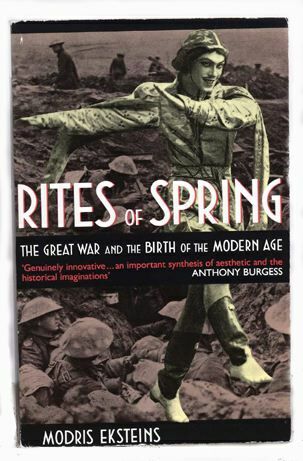 Rites of Spring: The Great War and the Birth of the Modern Age / Modris Ecksteins. -- London : Black Swan, 1990. Ecksteins takes readers on the fascinating journey of "Modernism" beginning with Stravinsky's The Rite of Spring, through the Great War and post-war, eventually to Hitler's suicide in the Spring of 1945. The Price of Pity : Poetry, History and Myth in the Great War / by Martin Stephen. -- 1st ed. -- London : Leo Cooper, 1996. An excellent, perceptive critical study of Great War poetry by the editor of Never Such Innocence: a New Anthology of Great War Verse. Not Unusual Young Men : Similarities in Diverse British Poets of the First World War / by Robert S. Means. -- 1994. Department of English, M.A. Degree, April 1994. Abstract: An explanation of the historical and literary background of World War I is necessary to demonstrate how and why the poetry of the war was written in the style that it was. Because of the social and literary conventions of the time, much patriotic verse was written throughout the war, and not (as is commonly believed) just at the start of the war by such poets as Rupert Brooke. Other major war poets (Siegfried Sassoon, Wilfred Owen, Robert Graves, and Isaac Rosenberg, for example) wrote patriotic verse, and many of them were actually influenced by Brooke's patriotic "War Sonnets," and were associated with him in the romantic Georgian School of poetry. A comparison between Sassoon and Brooke, in particular, demonstrates the similarities shared by the two poets, and suggests that, had he lived and experienced combat, Brooke's pre-war poetic style might have evolved as Sassoon's early poems did into a more realistic poetry. A new look at Brooke is needed to separate him from the myth laid on him by politicians and biographers. Within a social and historical context, Brooke's poetry can be appreciated as fitting the early days of the war. Because the cultural and historical aspects of the First World War are germane to the poetry of the war, a historical criticism is needed to fairly judge World War I poetry and poets. Poetry Is In the Pity : Wilfred Owen / by Sami Kirreh. -- 1986. Department of English, M.A. Degree, December 1986. Abstract: The meaning of the term "pity" as Wilfred Owen, an English poet who wrote during the First World War, uses it in his Preface, remains a perplexity to the minds of many critics. This study attempts to define "pity" specifically and closely in relevance to Owen' poems, and put it in a universal context that involves mankind in general. Visceral Imagery in the Poetry of World War I Soldier Poets / by Trenton L. Hickman. -- 1994. Wilfred Owen and Truth / by Hanadi I. Soudah. -- 1988. Department of English, M.A. 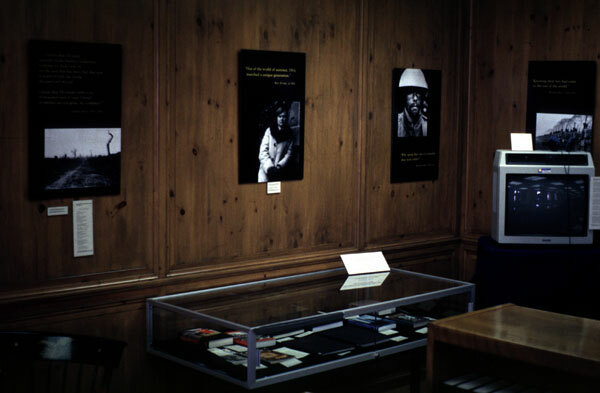 Degree, April 1988. Abstract: Wilfred Owen's life and poems have been studied extensively. but few critics have dealt with Owen's concept of truth, and then only briefly. This study attempts to define Owen's view of the truth about the trenches, describe his dedication to showing the horrors of war, put him into a period context, and show through a close study of some of his war poems his determination to reveal the truth he had gained by experience.